Performance is a buzzword for APIs. One of the most important and measurable parameters of the API performance is the response time. In this article, we will understand how to add code to measure the response time of an API and then return the response time data to the end client. So, let's take a moment to think why we would ever need such a feature to measure the Response time of an API. Following are some of the points that have been the inspiration for writing code to Capture response time. You need to define the SLA (Service Level Agreements) for your API with your clients. The clients need to understand how much time the API takes to respond back. The response time data over time can help us decide on an SLA for our API. Management is interested in reports as to how fast or slow the application is. You need to have data to corroborate your claims. It is worth it to have reports on the performance of the application and to share it with Stakeholders. The client needs to have the information of the Response time of the API so that they can track how much time is spent on the client and the Server. You might also have encountered similar requests in your project and it is worthwhile looking at an approach to capture the response time for the API. Let's explore a couple of approaches to capture the response time of our API focusing mostly on capturing the time spent in our API. Our objective is to calculate the time elapsed in milliseconds from the time the request is received by the Asp.net core runtime to the time the response is processed and sent back from the Server. What factors are we ignoring? It's important to understand that this discussion doesn't include the time spent in N/W, Time spent in IIS and Application Pool Startup. If the Application Pool wasn't up and running, then the first request can affect the overall response time of the API. There is an Application Initialization Module which we can make use of but that is out of scope for this article. This code should be able to calculate the time spent in an operation. But this doesn't seem to be the right approach for the following reasons. If an API has a lot of operations, then we need to add this code to multiple places which are not good for maintainability. This code measures the time spent in the method only, it doesn't measure the time spent on other activities like middleware, filters, Controller selection, action method selection, Model binding etc. Let's try to improve the above code by centralizing the code in one place so that it is easier to maintain. We need to execute the response time calculation code before and after a method is getting executed. If you have worked with earlier versions of Asp.net Web API, you would be familiar with concepts of Filter. Filters allow you to run code before or after specific stages in the request processing pipeline. We will implement a filter for calculating the Response time as shown below. We will create a Filter and use the OnActionExecuting to start the timer and then stop the timer in method OnActionExecuted, thus calculating the response time of the API. This code is not a reliable technique for calculating the response time as it doesn't address the issue of calculating the time spent in execution of middleware, controller selection, action method selection, model binding etc. The filter pipeline runs after the MVC selects the action to execute. So, it effectively doesn't instrument the time spent in the Other Asp.net pipeline. We will use the Asp.net Core Middleware to Calculate the Response time of the API. Basically, Middleware are software components which handle the Request/Response. Middleware is assembled into an application pipeline and serves in the incoming request. Each component does the following operations. Chooses whether to pass the request to the next component in the pipeline. Can perform work before and after the next component in the pipeline is invoked. We want to add code to start the timer once the request enters the ASP.NET Core pipeline and stop the timer once the response is processed by the Pipeline. Custom Middleware at the start of the request pipeline seems to be the best approach for getting the access to the request as early as possible and access until the last step is executed in the pipeline. We will build a Response Time Middleware which we will add as the first Middleware to the request Pipeline so that we can start the timer as soon the request enters the Asp.net core pipeline. What to do with the Response time data? Once we capture the response time data we can process data in the following ways. Add the Response time data to a Reporting database or an analytics solution. Write the Response time data to a log file. Pass the response time data to a message queue which can further be processed by another application for reporting and analytics. Send the Response time information to the client applications consuming our Rest API using the Response headers. There may be other useful ways of using the response time data. Please leave a comment and tell me how you process the response time data in your application. We will write the code considering the following points. Reporting the data back to client applications by passing the data in the Response headers. Full code snippet for the ResponseTimeMiddleware is shown below. // Name of the Response Header, Custom Headers starts with "X-"
// Add the Response time information in the Response headers. The interesting part happens in the InvokeAsync method, We use Stopwatch class to start the stopwatch once the requests enter into the first middleware of the request and then stop the stopwatch once the request has been processed and the response is ready to be sent back to the client. OnStarting method provides an opportunity to write a custom code to add a delegate to be invoked just before response headers will be sent to the client. Lastly, we add the Response time information in a Custom Header. We use the X-Response-Time-msheader as a Response Header. As a convention, the Custom Header starts with an X. In this article, we understood how to leverage ASP.NET middleware to manage cross-cutting concerns like measuring the response time of the APIs. There are various other useful use cases of using middleware which can help to reuse code and improve the maintainability of the application. In this post I'll walk through the process of adding localisation to an ASP.NET Core application using the recommended approach with resx resource files. Localisation in ASP.NET Core is broadly similar to the way it works in the ASP.NET 4.X. By default you would define a number of .resx resource files in your application, one for each culture you support. You then reference resources via a key, and depending on the current culture, the appropriate value is selected from the closest matching resource file. While the concept of a .resx file per culture remains in ASP.NET Core, the way resources are used has changed quite significantly. In the previous version, when you added a .resx file to your solution, a designer file would be created, providing static strongly typed access to your resources through calls such as Resources.MyTitleString. In ASP.NET Core, resources are accessed through two abstractions, IStringLocalizer and IStringLocalizer<T>, which are typically injected where needed via dependency injection. These interfaces have an indexer, that allows you to access resources by a string key. If no resource exists for the key (i.e. you haven't created an appropriate .resx file containing the key), then the key itself is used as the resource. In this example, calling GetLocalizedString() will cause the IStringLocalizer<T> to check the current culture, and see if we have an appropriate resource file for ExampleClass containing a resource with the name/key "My localized string". If it finds one, it returns the localised version, otherwise, it returns "My Localized string". The idea behind this approach is to allow you to design your app from the beginning to use localisation, without having to do up front work to support it by creating the default/fallback .resx file. Instead, you can just write the default values, then add the resources in later. Personally, I'm not sold on this approach - it makes me slightly twitchy to see all those magic strings around which are essentially keys into a dictionary. Any changes to the keys may have unintended consequences, as I'll show later in the post. For now, I'm going to ignore that concern, and dive in using Microsoft's recommended approach. I've started from the default ASP.NET Core Web application without authentication. These services allow you to inject the IStringLocalizer service into your classes. They also allow you to have localised View files (so you can have Views with names like MyView.fr.cshtml) and inject the IViewLocalizer, to allow you to use localisation in your view files. Calling AddDataAnnotationsLocalizationconfigures the Validation attributes to retrieve resources via an IStringLocalizer. The ResourcePath parameter on the Options object specifies the folder of our application in which resources can be found. So if the root of our application is found at ExampleProject, we have specified that our resources will be stored in the folder ExampleProject/Resources. Configuring these classes is all that is required to allow you to use the localisation services in your application. However you will typically also need some way to select what the current culture is for a given request. To do this, we use the RequestLocalizationMiddleware. This middleware uses a number of different providers to try and determine the current culture. To configure it with the default providers, we need to decide which cultures we support, and which is the default culture. Note that the configuration example in the documentation didn't work for me, though the Localization.StarterWeb project they reference did, and is reproduced below. 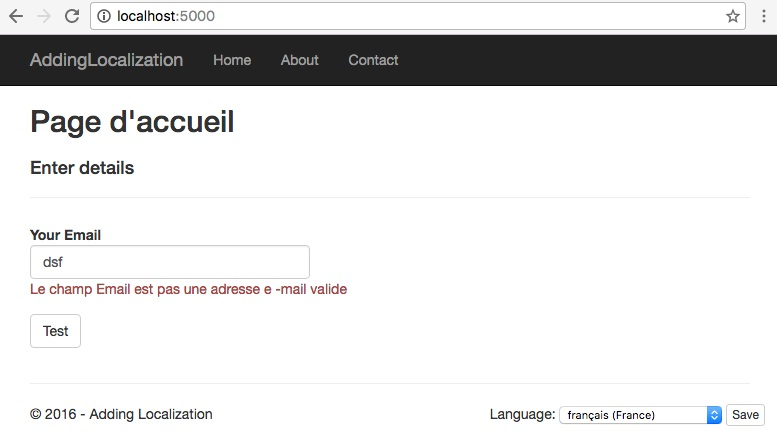 We now have most of the pieces in place to start adding localisation to our application. We don't yet have a way for users to select which culture they want to use, but we'll come to that shortly. For now, lets look at how we go about retrieving a localised string. If a resource exists in one of these files with the key "The localised title of my app!" then it will be used, otherwise the key itself will be used as the resource. This means you don't need to add any resource files to get started with localisation - you can just use the default language string as your key and come back to add .resx files later. There are two kinds of localisation of views. As described previously, you can localise the whole view, duplicating it and editing as appropriate, and providing a culture suffix. This is useful if the views need to differ significantly between different cultures. You can also localise strings in a similar way to that shown for the HomeController. Instead of an IStringLocalizer<T>, you inject an IViewLocalizer into the view. This handles HTML encoding a little differently, in that it allows you to store HTML in the resource and it won't be encoded before being output. Generally you'll want to avoid that however, and only localise strings, not HTML. One final common area that needs localisation is DataAnnotations. These attributes can be used to provide validation, naming and UI hints of your models to the MVC infrastructure. When used, they provide a lot of additional declarative metadata to the MVC pipeline, allowing selection of appropriate controls for editing the property etc. Error messages for DataAnnotation validation attributes all pass through an IStringLocalizer<T> if you configure your MVC services using AddDataAnnotationsLocalization(). As before, this allows you to specify the error message for an attribute in your default language in code, and use that as the key to other resources later. A key thing to be aware of is that the DisplayAttribute is not localised using the IStringLocalizer<T>. This is far from ideal, but I'll address it in my next post on localisation. These allow you to specify a culture in the querystring (e.g ?culture=fr-FR), via the Accept-Languageheader in a request, or via a cookie. Of the three approaches, using a cookie is the least intrusive, as it will obviously seamlessly be sent with every request, and does not require the user to set the Accept-Language header in their browser, or require adding to the querystring with every request. 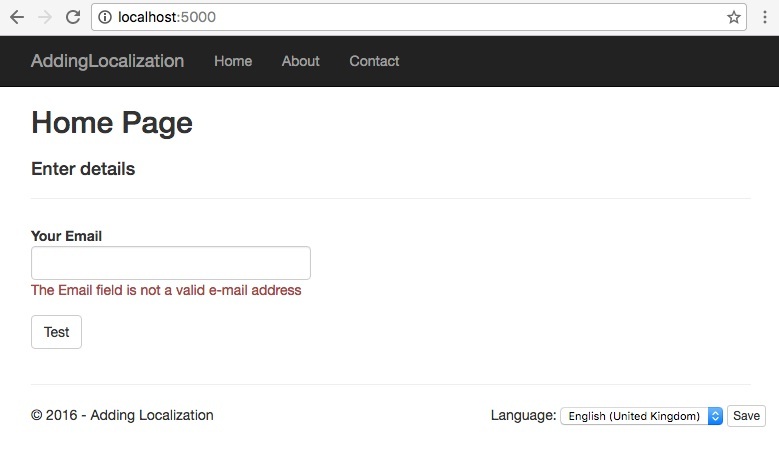 Again, the Localization.StarterWeb sample project provides a handy implementation that shows how you can add a select box to the footer of your project to allow the user to set the language. Their choice is stored in a cookie, which is handled by the CookieRequestCultureProvider for each request. The provider then sets the CurrentCulture and CurrentUICulture of the thread for the request to the user's selection. As you can see, the validation attributes and page title are localised, but the label field 'Your Email' has not, as that is set in the DisplayAttribute. In this post I showed how to add localisation to your ASP.NET Core application using the recommended approach of providing resources for the default language as keys, and only adding additional resources as required later. One of the nice things that the new ASP.NET Core stack brings to the table, is Dependency Injection (DI) as a first-class citizen, right out of the box. DI is nothing new, even for ASP.NET, but in the earlier versions, it wasn't baked into the platform, and developers were forced to jump through hoops in order to enable it. While others, like WebForms and Katana, doesn't. Some will argue that the IDependencyResolver-type abstraction, which is essentially an implementation of the Service Locator pattern, is an anti-pattern and should be avoided, but that's a discussion for another day. There are also other ways of achieving DI within some of the frameworks; MVC has IControllerFactory and IControllerActivator, Web API has IHttpControllerActivator etc. All of these are extensibility points that you can implement in order to leverage DI in your controllers. As you can see, it quickly starts to add up - and this is just for a single container! Imagine if I'd compiled a list for the gazillion different IoC containers in the .NET space. Each of the adapters needs to be maintained, updated, versioned etc. That's a big burden on the adapter maintainers and the community in general. On the consuming side of this, for a typical web application using MVC, SignalR and Web API, you'd end up needing three (or more) of these adapters, in order to leverage DI across the application. Even though a lot of ideas and code have been carried forward from Katana, ASP.NET Core is by all means a re-imagining, re-write, re-EVERYTHING of the entire, current ASP.NET stack. 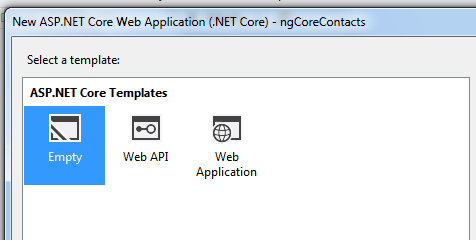 Hell, it's even triggered a re-jigging of the entire .NET (Core) platform and tooling. This means that it's a perfect time to bring DI into the platform itself, and make all components on top benefit of a single, unified way of doing DI. Say hello to IServiceProvider! Even though the interface itself isn't new (it's been living in mscorlib under the System namespace since .NET 1.1), it's found new life in the ASP.NET Core DI system. It's also accompanied by a couple of new interfaces; IServiceCollection, which is essentially a builder for an IServiceProvider and IServiceScope, which is intended for resolving services within a specific lifetime scope, like per-request. In order for things to Just Work™, out of the box, Microsoft have implemented a lightweight IoC container that ships with the ASP.NET Core hosting layer. It's in the Microsoft.Extensions.DependencyInjection NuGet package. // This method gets called by the runtime. // Use this method to add services to the container. // Adds the services MVC requires to run. In this method, you're free to add whatever services your application needs, and they will magically be available for constructor injection across the board. Different components in the stack also ship with extension methods to conveniently add the services the component needs to the collection, like AddMvc (shown above), AddCors, AddEntityFramework etc. Now, it's important to note that the default implementation, living in Microsoft.Extensions.DependencyInjection is a deliberately lightweight, feature poor (is that a word? ), fast, implementation of an IoC container. It has just the amount of features needed for the runtime/platform/framework to compose itself and run. A "lowest common denominator" feature set, if you will. If you want more advanced features, like many do, Microsoft actively encourages you to Bring Your Own Container (BYOC), or layer the functionality on top, which I've done with Scrutor. This brings us back to IoC container adapters. // Create an instance of a StructureMap container. // services from the IServiceCollection. // and return it to the runtime. By doing this, all components will resolve its services from the StructureMap container, and you'll be able to utilize the full feature set of StructureMap, like awesome diagnostics, property injection, convention based registrations, profiles, decoration etc. This post turned out longer than I expected, just to show a couple of lines of code at the end, but I thought it would be interesting to put everything in perspective and hopefully you did too. As you can see the DI story has been greatly simplified in the this new world, while still allowing you, as an application, library or framework developer, to utilize DI across the board, with minimal effort. This tutorial aims for starting Angular 2 in ASP.NET Core using Visual Studio 2015. The release of Angular 2, ASP.NET Core RC is becoming interesting to build SPA. I have compiled the steps involved in starting to learn Angular 2. This is detailed explanation, you will feel much easier at end of article. I used Visual Studio 2015 Community Edition Update 3(Must update), TypeScript 2.0 (must), latest NPM, Gulp. ASP.NET Core is designed as pluggable framework to include and use only necessary packages, instead of including too many initial stuff. Lets create HTML file named “index.html” under wwwroot folder. Right click on wwwroot folder, Add New Item and create index.html file. This HTML page will act as default page. For ASP.NET Core to serve static files, we need to add StaticFiles middle ware in Configure method of Startup.cs page. Ensure that packages are restored properly. project.json is redesigned to make it better, we have Static Files middleware to serve static assets like HTML, JS files etc. Run the application now, ASP.NET Core renders static HTML page. Delete this index.html page, we will be injecting this dynamically later. Till now you saw demonstration of “wwwroot“ as root folder for ASP.NET Core web apps. Angular 2 is famously claiming to be ONE Framework for MOBILE and DESKTOP apps. There’s won’t be any breaking changes after final release. This tutorial refers 5 MIN QUICK START for getting started, it’s more focused on other light weight code editors; but here we are using Visual Studio 2015 Community Edition Update 3 for its built in TypeScript tooling and other features. Majority of webpack scripting is based on AngularClass’s angular2-webpack-starter. I have modified according to ASP.NET Core web apps. Angular 2 team is pushing the code changes using NPM rather than CDN or any other source, due to this we need to add NPM configuration file (package.json) to this ASP.NET Core application. Right after saving this, ASP.NET Core starts restoring the packages. It would download all packages mentioned independencies section of above package.json. Sometimes in solution explorer you might see ‘Dependencies – not installed’, don’t worry this bug in tooling. All the npm packages are installed. Add “tsconfig.json” in the project, copy paste below configuration. It’s mandatory to install TypeScript 2.o for working with Angular 2. At present typings.json is not required because we are using @types with TypeScript. However if your using any other packages which don’t have entries in @types then typings.json has to be added. In package.json, we have added “webpack“ packages as “devdependencies“. They will perform all bundling work. There are some common functionalities and some specific to environments. We will focus on development and productionenvironment to write accordingly. Development environment should have source maps for debugging TypeScript files, minifying bundles of JS, CSS etc files not necessary. Production environment should minify bundles to reduce loading time, do not include source maps. Webpack 2 also does tree shaking i.e. eliminate unused code to further reduce bundle sizes. webpack.config.js – Based on environment set process.env.NODE_ENV, it runs either dev or prod configurations. Webpack.common.js before bundling environment specific files, it performs tasks meant to be used for both environment. CleanWebpackPlugin cleans “wwwroot/dist” folder every time we run it, so that we get fresh set of files. I told you above to delete the index.html file, now the clientsrc/index.html will be moved to wwwroot usingHtmlWebpackPlugin. Plus Webpack injects the bundle files i.e. polyfills, vendor, boot JS files and includes them in HTML script reference. Loads application in debug mode with source map. Everything run in memory i.e. html, js, static files are loaded in memory. Merges all the bundle files and copies to wwwroot. We have app folder containing HTML, Angular 2 components and root level module (app.module.ts) which gets loaded while bootstrapping application. Some of files might be not interesting now, will focus them in separate articles later. Before running make sure you have run command “npm install”. This might not be needed but still it will ensure all packages are installed. From command line (directory should be same as package.json), type “npm start” & hit enter. It will start running the webpack-dev-server which loads application and listens on localhost:3000. When on console it says “bundle is now VALID” then open a browser and navigate to http://localhost:3000 to see application getting loaded. Notice wwwroot folder, we don’t see any files copied because everything is running in memory. When browser starts rendering index.html page, it encounters <my-app>Loading…</my-app> tag. Clientsrc/src/Appcomponent then resolves the <my-app> tag as selector in it and renders UI with TypeScript code. This invokes webpack-dev-server, runs the development config and watches for any changes in clientsrc folder. Any changes in this folder will reload application with changes.